WEST POINT, Ala. – Area play began for the West Point Warriors Tuesday night and they opened things up with a 5-3 win over Lawrence County. The Red Devils took a 1-0 lead in the top of the third, but West Point plated three runs in the bottom of the fourth to move in front and held on to win it 5-3. After being held scoreless for three innings, the Warriors got the bats going in the fourth when they scored two runs on RBI singles from Aubry Cleghorn and Carter Thornton and took a 3-1 lead when Branson Smith scored on a wild pitch. Lawrence County scored one in the top of the fifth to tie things up, but Rylan Jones put West Point back on top for good in the bottom half of the inning. The senior first baseman connected with one and drove it over the right field fence to give the Warriors a 5-3 advantage and that proved to be enough to start area play 1-0. Cleghorn got the start on the hill for West Point and went six innings, allowing three runs on seven hits and collecting six strikeouts before Blake Diestelow came in to close out the final frame. The Warriors recorded just five hits in the win, led by Smith who finished with two. Jones (one hit) led the team with two RBIs. West Point will look to stay in the win column when it travels to Lawrence County finish the series on Thursday. After falling behind 2-0 right out of the gate, the Bulldogs answered and tied the game at 2 in the bottom of the first. Locust Fork added two more in the top of the second to retake the lead, but it was all Hanceville the rest of the way. The bats got hot for the Bulldogs and they pulled away to win it comfortably. Mark Dyer (three hits) and Matthew Cornelius (two hits) both racked up three RBIs in the win and Isaac Holmes (one RBI) finished with a pair of hits as well. After blowing out the Hornets in their first matchup of the night, the Bulldogs got off to a fast start in this one as well but couldn’t put them away early. Locust Fork found more offense this time around, but it still wasn’t enough to overcome Hanceville, who pulled away to win it 14-9. Mark Dyer finished the game 3-for-4 at the plate with two RBIs and Ashton James (one hit) drove in two runs as well. The Patriots took an early lead in the bottom of the first, but Cullman answered with a pair of runs in the top of the second and two more in the top of the third to move ahead for good. Brady Patterson (one RBI) and AJ Miller (two RBIs) each led the ‘Cats with three hits in the win. Brennen Norton (one RBI) and Niklas Fondren each collected a pair of hits as well. The Aggies put the Raiders away early on Tuesday night by scoring three in the first and two in the second. Dayne Black went the distance for Fairview on the mound and held Good Hope to just two hits in the shutout win and racked up 15 strikeouts. Dalton Payne went 3-for-4 at the plate for the Aggies and collected three RBIs while Malcolm Parker, Riley Carroll and Black each recorded two hits in the win. 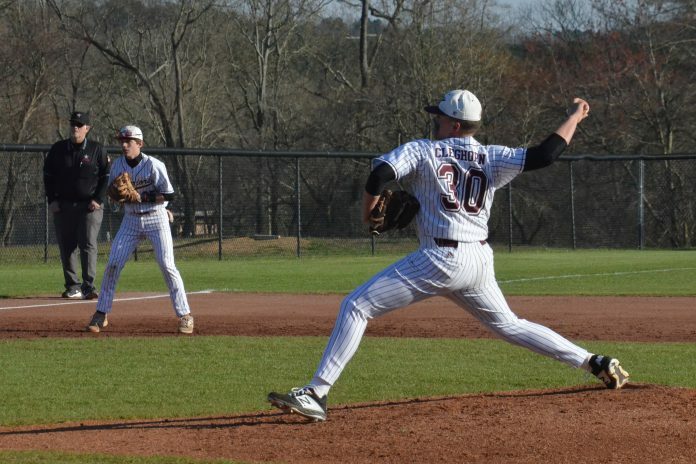 The Eagles were able to hold the lead most of the way in this one, but Cleveland brought in 12 runs in the bottom of the fifth to put the game out of reach for Cold Springs. Roberto Ayala (one hit), Lawson Burgess (one hit) and Brylan Aaron (one hit) each recorded an RBI for the Eagles.